Is it a person's ethnicity, a culture or religion -- or a mix of the three? And how does one practice being a Jew? After thousands of years of Jewish history, the answer to the question remains complicated, according to a new survey. The Pew Research Center's report on Jewish Americans, released Tuesday, sought to answer how Americans define their Jewishness and to look at trends in religious beliefs and practice, denominational affiliation, intermarriage and views on Israel, among other issues. Estimating there to be a total of 5.3 million Jews in the nation, Pew found that 78 percent of them said being Jewish is part of their religion, while 22 percent said they are Jewish with no religion. But growing generational differences are wide, as just seven percent of Jews in the Greatest Generation (those born between 1914 and 1927) said they have no religion while 32 percent of Jewish Millennials (those born after 1980) said the same. The percentage of Americans who define their religion as "Jewish" has dropped by about half since the late 1950s, while one in five Jews now say they have "no religion" but are Jewish by ancestry, ethnicity or culture, the research organization found. 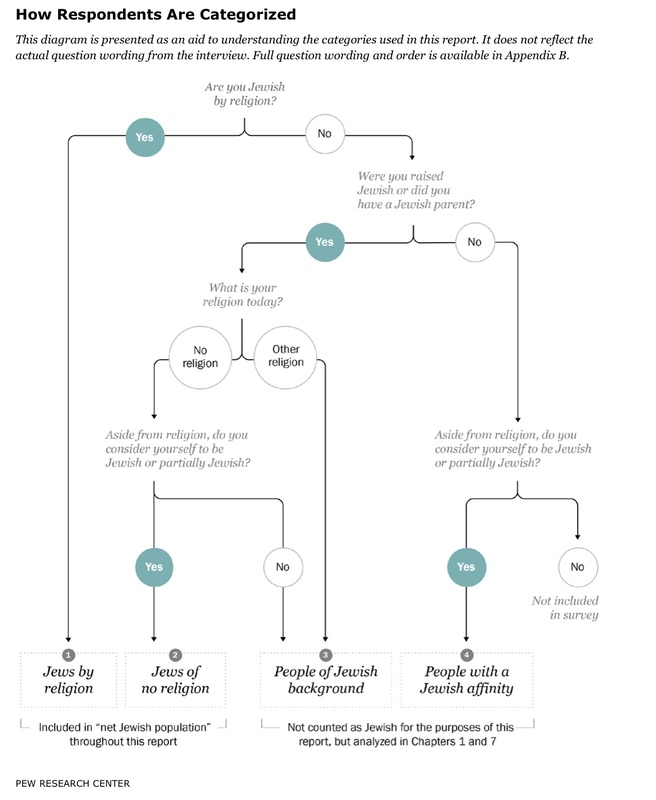 To survey, Pew had to first dissect how people come to call themselves Jewish. The question has no simple answer. A Jew is traditionally defined as someone born to a Jewish mother. But there's disagreement among Jews regarding people with Jewish fathers but not Jewish mothers, atheists and agnostics who were born into Jewish families, non-Jews who later married Jews and those born into the faith who have converted to Christianity and other religions. "Many 'Jews by religion,' or those who said they were Jewish when asked about religion, are actually not particularly religious," said Greg Smith, the Director of U.S. Religion Surveys at the Pew Research Center's Religion and Public Life Project. "For example, when we ask how important religion is in your life, among 'Jews by religion,' only 31 percent say it's very important to them." Smith and other researchers found that 62 percent of Americans say being Jewish is mostly an issue of ancestry and culture. A smaller group, 15 percent, said they defined Jewishness mainly by the practice of the Jewish religion. 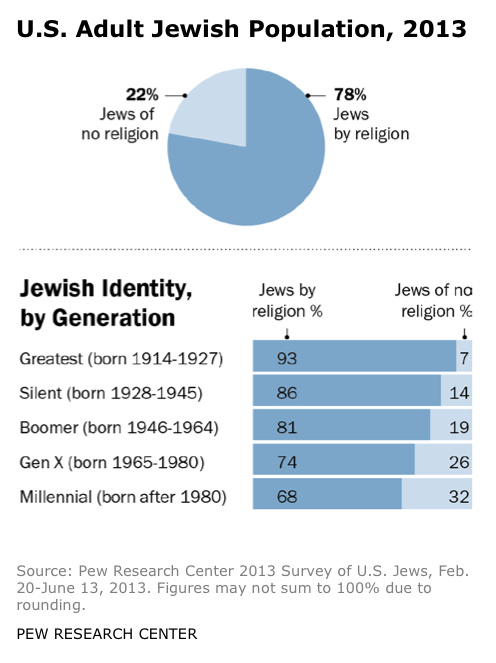 But even among those who identified religiously as Jewish, more than half said Jewish identity was mainly related to ancestry and culture, and two-thirds said one doesn't have to believe in God to be Jewish. At the same time, about 60 percent said a person who believes Jesus was the messiah cannot be Jewish. Most Jews also said that remembering the Holocaust (73 percent) and "leading an ethical life" (60 percent) were essential to their Jewishness, while just above half said supporting justice and equality was important to being Jewish. Only 19 percent said that following Jewish law was essential to Jewish identity. Meanwhile, among Orthodox Jews, 79 percent said the same of observing Jewish law. On their relation to Israel, about 70 percent of Jews said they feel "very" or "somewhat" attached to Israel, and 43 percent said they have been to the nation. Regarding the Israeli-Palestinian conflict, 38 percent of American Jews think the Israeli government is making a "sincere effort" to establish peace. Fewer, 12 percent, think Palestinian leaders are making a sincere effort. Only 17 percent of U.S. Jews said building Israeli settlements in the West Bank helps Israel's security. "A lot of these findings are in line with what we have been seeing among our community," said Rabbi David Saperstein, Director of the Religious Action Center of Reform Judaism. "Intermarriage is a concern, so we have been making strong efforts to welcome intermarried couples and help them raise their families. Israel remains a very important part of people's Jewish identity, but that doesn't mean people can't be critical of its policies." 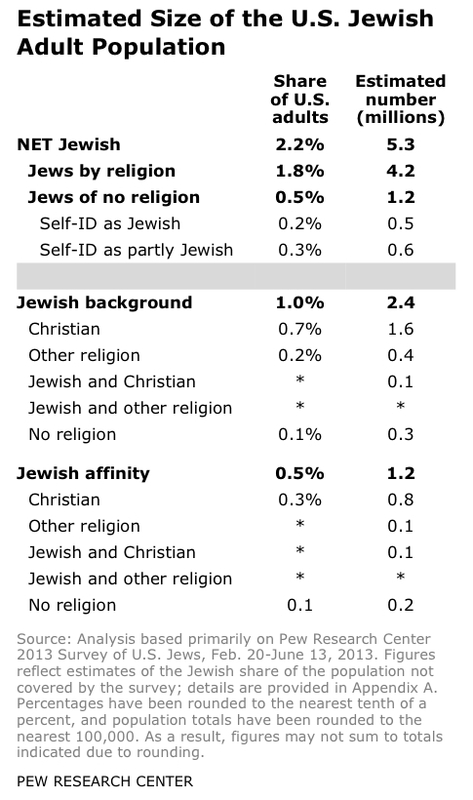 Pew found that those who identified as secular and cultural Jews differed greatly from their religiously identified counterparts. They were less likely to be a part of Jewish organizations, and two-thirds said they were not raising their kids Jewish or partially Jewish, compared to more than 90 percent of people who identified as religiously Jewish and were at least in part raising their kids to be Jewish. In a related trend, the study also found that 79 percent of married Jews who said they had "no religion" had non-Jewish spouses. 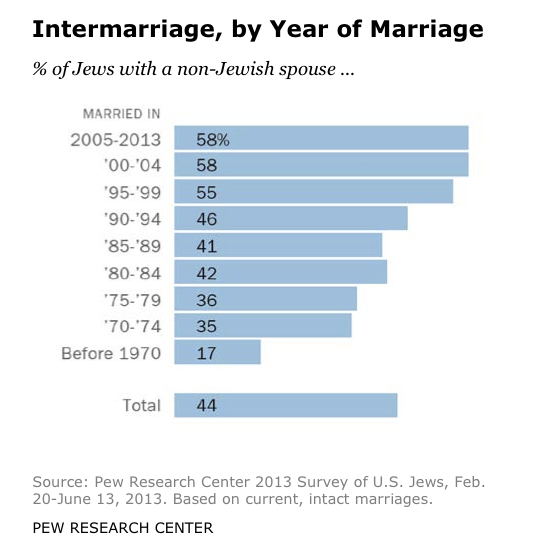 Among those who identified religiously as Jewish, 36 percent married non-Jews. Overall, intermarried Jews were less likely to raise their kids as Jewish. Smith pointed out that Jews also tend to be less religious than other faith groups in the U.S.
"Among the population as a whole, 56 percent say religion is very important to them, while among Christians, seven-in-ten say religion is very important to them," said Smith, citing prior Pew surveys on American religion. Orthodox Jews are the exception, Smith added, saying they are among the most religiously committed groups in the country. But regardless of how important religion is to them, eight-in-ten Jews said simply being Jewish was very or somewhat important in their lives. 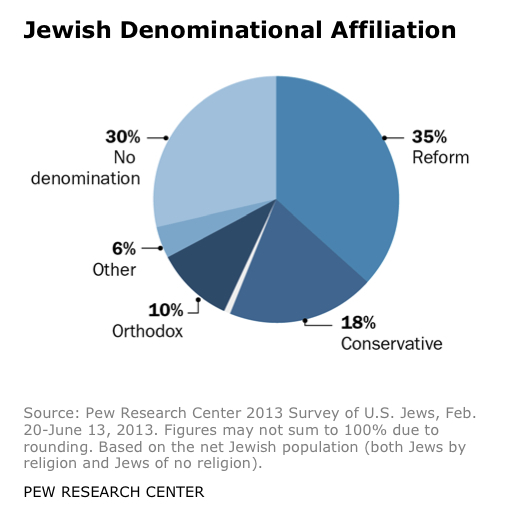 In terms of denominations, Reform Judaism was the largest Jewish movement among respondents, followed by Conservative Judaism and Orthodox Judaism. Smaller groups, such as Reconstructionist and Jewish Renewal movements, made up only six percent of Jews, while about about 30 percent of Jews said they were not part of any denomination. The report found that most "religious switching" among Jews is happening from more traditional to less traditional denominations (for example, Orthodox to Conservative or Conservative to Reform). Orthodox Jews were the smallest of the three major Jewish denominations, and were on average younger with larger families. "In the past, high fertility in the U.S. Orthodox community has been at least partially offset by a low retention rate: Roughly half of the survey respondents who were raised as Orthodox Jews say they are no longer Orthodox," said a release from Pew. "But the falloff from Orthodoxy appears to be declining and is significantly lower among 18-to-29-year-olds (17 percent) than among older people." The report, “A Portrait of Jewish Americans," was based upon questions asked via landlines and cellphones to 3,475 Jews across the U.S. between February 20 and June 13. Those who were surveyed were picked from more than 70,000 screening interviews that identified Jewish respondents. In its report, Pew categorized Jews as "Jews of religion," "Jews of no religion," "people of Jewish background" and "people with Jewish affinity." Follow the chart below to see where you would fall.